Focus: Autofocus. Compatibility: Sony E Mount. Serial: 129206. Photos are of the actual item! 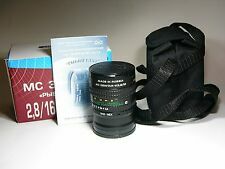 Minolta MC lens rectilinear fisheye. Fast f/2.8 lens great for landscape and astrophotography. Manual focus. Minolta 16mm F/2.8 Fisheye. Minolta lens from the 1970s, has built-in filters originally for B&W and color film photography. Love this lens for its versatility, fast aperture, and incredibly compact and lightweight design. If you pick 2 quantities. The lens enables to have a 180° diagonal angle of view. When focus is set to the hyperfocal distance, from f/ 5.6 onwards the DOF extends from 0.8 m to infinity, and no autofocus is necessary. The lens has an automatic jumping diaphragm that adjusts with the advance defined lens stop value while shooting. 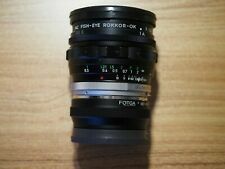 For E 16mm F2.8, E 20mm F2.8. E 20mm F2.8 with a focal length of 16mm. E 16mm F2.8 with a focal length of 12mm. 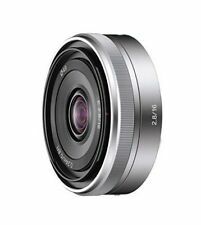 E 16mm f / 2.8, E 20mm F 2.8 compatible converter which can easily enjoy super wide angle perspective shooting. 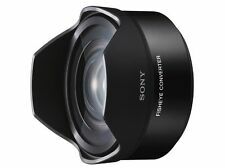 Lens fitting:Sony E-mount. 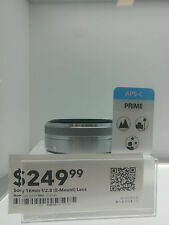 Sony Nex mount. Relative aperture:maximum f/2.8, minimum f/22. Completeness:Lens, manual, box, case. Focal length:16mm. We will try do everything we can to resolve the issue. Fisheye Converter VCL-ECF2. E 16 mm F 2.8 when mounted 10 mm (15 mm equivalent). E 20 mm F 2.8 when mounted 13 mm (equivalent to 20 mm). Lens front cap. Weight: About 150 g.
MPN: SEL16F28. Model: E 16mm F2.8. 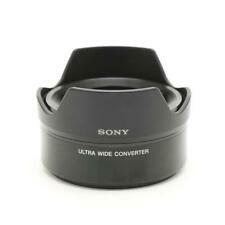 Compatible Mount: Sony E. 100% Authentic Genuine Products. Comparable 35mm Focal Length: 24 mm. (ex Russia). 9.45" (24 cm). When mounted focal length SEL16F2.8: 10mm (15mm equivalent 35mm format) /SEL20F2.8:13mm (20mm equivalent 35mm equivalent). The initial failure of a new product needs to request a maker. Lens construction: four group 4.